The Eton 44 from the Arrowflame Designer Collection. The Eton from the Arrowflame Designer Collection is a classically styled electric fireplace, with clean lines to suit all decors. The Eton models are complete free standing fireplace packages that simply plug in to a regular outlet and can be placed against any wall in your home, this model is available in white, oak, cherry and distressed black. 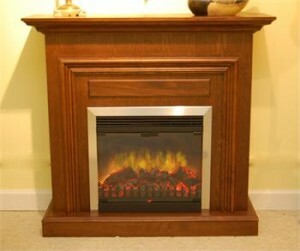 The mantel is constructed from high quality solid wood veneers and molding with a hardwood core, resulting in an outstanding quality piece of furniture. The firebox has a 5,000 BTU heater that can be switched on via the remote control to provide instant heat.